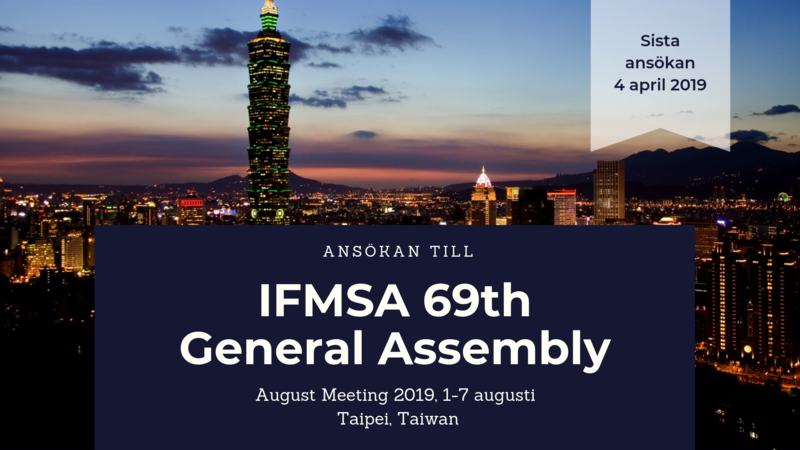 General Assembly (GA) is IFMSA:s largest international meeting forum. Here you will meet students from IFMSA:s 133 member organizations for a week to exchange experiences, decide IFMSA:the future, inspired and socialize. The next meeting will be held in Taipei, Taiwan 1-7 August. Obviously, Sweden on site! We urge you to seek, new and old, regardless of previous experience. Applications will be reviewed by a selection group, and ranked among other things with regard to the earlier commitment and personal goals of the meeting. Valgruppen also trying to bring a delegation to an even distribution between local resorts. On the GA working representatives of our working groups to improve their projects and spread them to new countries. Major decisions affecting the entire Federation will be and next year's international Board elected. In accordance with the theme of the meeting is also held lectures and other fun. All this is interspersed with the social program consisting of unbeatable celebrations (guaranteed multicultural elements) and opportunities to get to know people from all over the world. With Swedish passport, so it should not require a visa to Taiwan, If you have any other nationality as may be required. It is your responsibility to review and fix visas, but if you think you will need to apply for a visa to go to GA, tick it on the question at the bottom of your application to be able to help you in the best way. Charge: The meeting fee is 425 €, which partially charge paid by IFMSA-Sweden, that 200 € sponsored by Delegate. Travel to / from Taiwan funded by the delegate himself. Deadline for applications is 4/4 at 23:59! Now the application to GA, March Meeting, opened!